Of course a cake like this would be great at a winter wedding when it’s cold outside. In the summer I’d go with a naked chocolate cake – less icing is a good idea for those steam summer months. 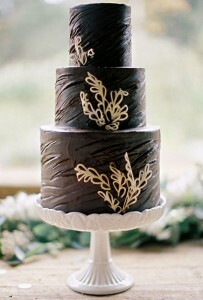 This three-tiered chocolate cake is made even more incredible by the white floral details. You don’t need much more on this cake – no cake topper necessary. You can find this dark chocolate wedding cake here. It was created by the Sweet & Saucy Shop.